I have been using recycled wax to make candles with for almost a year now. Last June I put up a sign at Craft 2.0 saying I could recycle old candles. This resulted in me becoming the proud owner of more than 100kg of old convent candles that a nun had collected up to recycle herself. I have been slowly working my way through all of the boxes, sorting and weighing them, and filtering out all of the gunk so the wax can be used again for new candles. 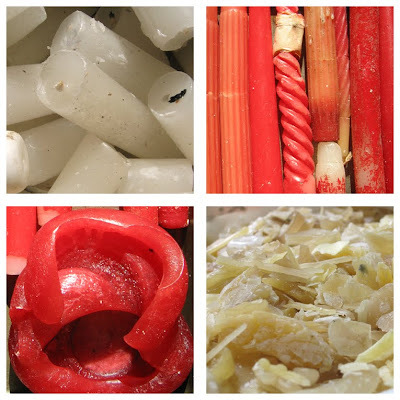 There are lots of different types – beeswax candle stubs, paraffin candle stubs and some quite large bags of little pieces of wax that have dripped down the side of a candle holder, and been scraped off. There are also some blocks of unused paraffin, which also needs to be made into candles, rather than sitting gathering dust in someones garage. I thought I'd share a bit about how I go about recycling all of this wax, to explain how it works. Firstly, I sort the candles by colour and wax type. This is done by eye, so if two kinds of wax have been mixed together, I can't tell what percentage of each wax they contain. 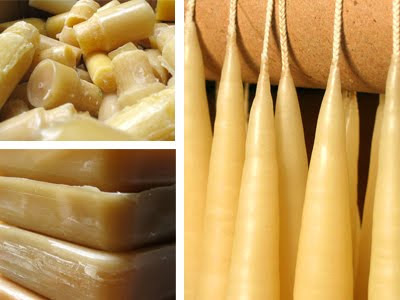 Often beeswax candles can contain a higher proportion of paraffin wax. Also, when you're melting the contents of a bag of wax chips, it's impossible to tell exactly what blend of wax might be in there. So although I can't offer a guarantee of what type of wax a candle contains, I do have a pretty good idea. Then I melt the sorted wax down, and filter out all of the dirt, dust, wicks, stickers and anything else that may have accumulated. I end up with block of clean purified wax ready to be made into new candles. I also collect as much as I can of the waste wax that accumulates during the candle making process, such as drips and spills etc, and recycle this too. This wax doesn't get sorted first though, as it's often already mixed up. So it usually ends up as one of many shades of brown! I then mix this with some beeswax, and make it into block candles. It's very satisfying to take something that is usually thrown away, and turn it into something beautiful. I hope you enjoy the candles as much as I enjoy making them! Floating citronella candles, Hand-dipped tapers and recycled tealights. Some of the mini-teardrops are made from recycled wax, the older ones aren't. Thanks! I've been meaning to write them for ages. After a while I realised a lot of people didn't actually know what I meant by recycling candles, and I thought it was important to share the philosophy behind what I do.